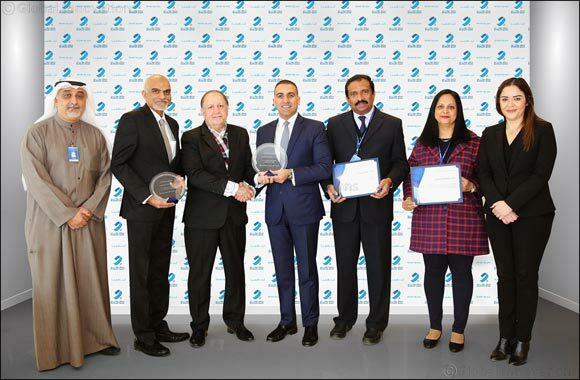 Kuwait- 11 February 2019: Burgan Bank recently received the coveted ‘Quality Recognition Award’ for the year 2018 from J.P.Morgan Chase, in recognition of its consistently high quality performance. The award highlights the bank’s advanced standards maintained in the complete range of clients’ US Dollar funds transfer operations by the management and staff. J. P. Morgan Chase commends the bank for achieving 99.58 percent straight-through processing (STP) in the MT103 category and 99.77 percent for the MT202 category of payments, thus, entitling Burgan Bank to the ‘Elite Quality Recognition Award’ in both categories. Highlighting the best-in-class straight-through processing (STP) rates, Burgan Bank was among the few banks across the MENA region to receive the Elite level of the award for both its customer and bank to bank transfers. Upon the methodology and mechanism, the 2018 Quality Recognition Awards are divided into two groups, within which each award is presented to those who exemplify to optimal level of performance. The MT103 awards are based on a minimum of 10,000 US Dollar MT103 debit transactions wherein the Quality Recognition Award applies from 90% to 98.9% Straight Through Rates while the Elite Quality Recognition Award is applied for 99.0% and higher Straight Through Rates. The MT202 awards are based on a minimum of 8,000 US Dollar MT202 debit transactions, which constitutes the Quality Recognition Award from 98% to 99.69% Straight Through Rates followed by the Elite Quality Recognition Award that is 99.7% Straight Through Rate and higher. Mr. Sherif Abdelsalam – Executive Director, Treasury Services, and Head of GCC Financial Institutions Coverage added that Burgan Bank is once again amongst the less than 1% of their total funds transfer clients qualifying for this prestigious accolade. The J.P. Morgan Chase awards reflect Burgan Bank’s commitment to ensuring systematic outstanding financial services and solutions that cater to their customers’ requirements. J.P. Morgan Chase has been supporting the industry by awarding selected US dollar clearing clients since 1997, who have managed to successfully achieve a first rate level of operational excellence and exemplary straight-through results by properly formatting their SWIFT payments. J.P. Morgan Chase & Co. is an American multinational investment bank and financial services company headquartered in New York City. They are the #1 U.S. dollar treasury and commercial clearer globally, the #1 Tokyo dollar clearer, and the #3 Euro clearer. They provide robust capabilities and solutions designed to meet treasury, settlement, risk management, commercial and trade business requirements.